The Ferrari 365 GTB/4, better known by the unofficial name Ferrari Daytona, is a grand tourer automobile produced from 1968 to 1973. 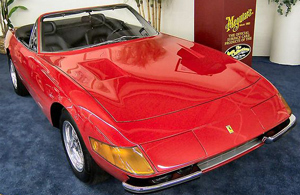 The Ferrari Daytona parts and line was designed by Pininfarina who made a wounderful job. It has 4.4-litre V12 engine fed by six Weber twin-choke 40 mm carburettors, the excellent weight distribution provided by the rear gearbox transaxle conveys this car a rare balance. Find as follows some of our Ferrari Daytona parts. For further information about Ferrari Daytona parts & Ferrari 365 GTB/4 parts drop us a line.